Many folks attend this PBOT-sponsored open house, held in the Parkrose Heights neighborhood, to learn more about a plan that will eliminate half the driving lanes on NE 102nd Avenue. 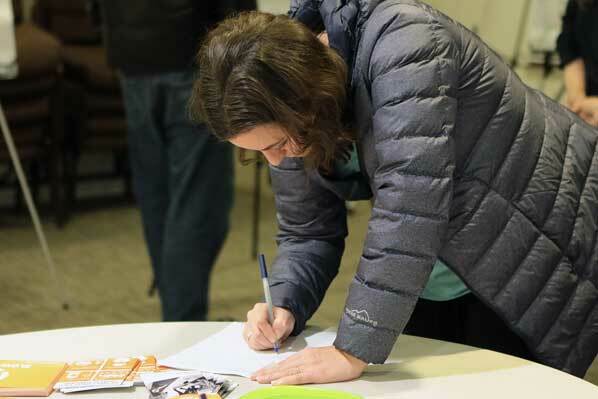 Throughout the evening of January 9, some 50 neighbors turned out for an open house hosted by the Portland Bureau of Transportation (PBOT), at Crossroads Church Community Room, to learn more about the “NE 102nd Avenue Safety Project”. 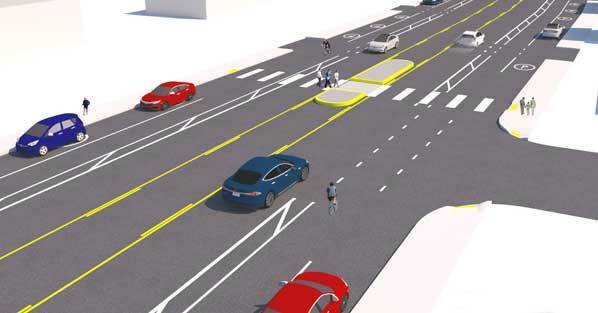 This PBOT illustration shows how the “NE 102nd Ave Safety Project” would impact vehicle traffic on the street. The plan proposes to strip off one vehicle travel lane on both the northbound and southbound sides of the road, while adding captious bicycle lanes. “To me, it looks more like the ‘Cause traffic backups on NE 102nd Avenue plan’ than anything else, wryly commented Will Davis, after studying exhibits posted around the room. City of Maywood Park neighbor Ron Dickson completes a survey about the project. In addition to affecting Portland residents in the Parkrose, Parkrose Heights, and Woodland Park neighborhoods, the proposal may well have a substantial impact on 800+ residents of the City of Maywood Park, too, pointed out one of that city’s citizens, Ron Dickson, at the meeting. “This street runs just east of our city,” explained Dickson. “The problem is this: On busy days, many drivers take a shortcut by turning off NE Sandy Boulevard onto Prescott Street, then cut south on SE 99th Avenue. “The intersection with 99th Avenue this not protected by stop signs; in heavy traffic, dozens of cars line up there,” Dickson pointed out. PBOT Program Manager Clay Veka talks with neighbors. Not all of those attending were as vehemently opposed to the project. 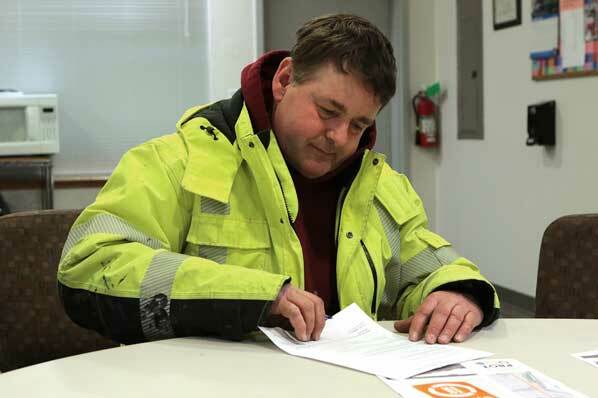 “I feel cautiously optimistic that this will help our community feel more connected, easier to navigate, and safer,” commented Parkrose neighbor Sara Kirby. After talking with PBOT officials and neighbors, Parkrose neighbor Sara Kirby completes a survey form. “Right now I don’t feel comfortable having my kids walk along NE 102nd Avenue or crossing the street; so I’m curious to see what the positive benefits are of this, balanced with seeing both the plans – and the funds – to mitigate both the intended and unintended impacts of the pilot study,” Kirby said. At the open house, attendees were asked to complete a multiple-choice questionnaire, or to fill in a comment sheet. Although we’ve requested the results of the survey from PBOT, so far, those tabulated results remain unavailable. 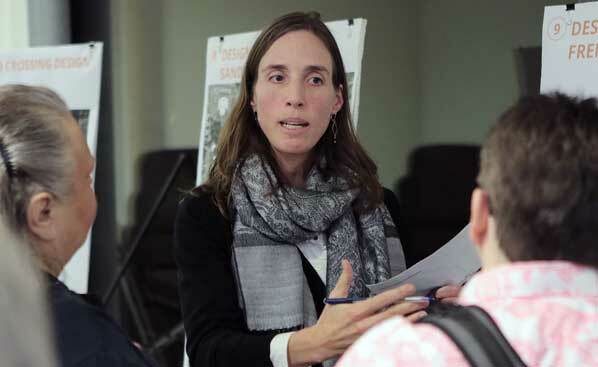 Neighbors learn that neither the cost, nor the consequences, will be known – until after this “road diet” project is completed. PBOT plans to install this project as “a pilot” this spring so residents can see how it functions. This fall, PBOT will evaluate safety and operations on NE 102nd and neighborhood streets, and look at how effective the project has been at meeting project goals. Using the data gathered during the pilot and the evaluation, PBOT will determine the final design for NE 102nd Avenue, and implement mitigation on neighborhood streets if necessary. The cost of the pilot project and its final implementation remain undisclosed.